Gravlax translated from Scandinavian means simply “buried salmon”. During Middle Ages fishermen prepared salmon by burying it in the sand above the high – tide line. Today gravlax is prepared by “burying” it in a salt and sugar mixture (sometimes with the optional addition of herbs, spices and citrus zest) and currying it for a few days/hours or even minutes. In fact you could cure any fatty fish the same way, be creative. 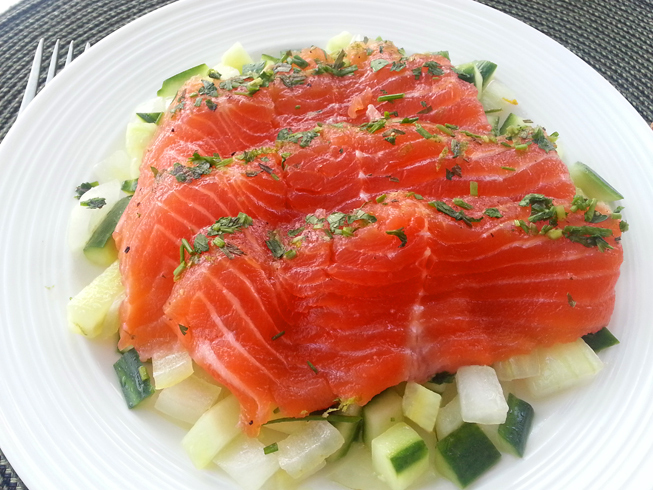 There are a million different preparations for gravlax, and I will post a few different ones in the future. However I want to start with one that’s adapted from a book “Jacques Pepin Celebrates” by, you guessed it, Jacques Pepin. It is truly a recipe worthy of a king. I highly recommend you pick up and read at least one of his books if you want to be a better chef. There are, certainly, plenty of various recipes online; Epicurious, Food Network, or Google will provide you with anything your heart desires. You can learn technique by watching YouTube videos, however what these sources are lacking – are valuable inputs as to why you have to do something a certain way, Jacques’ wisdom and experience patiently guide you through the process of cooking, by following his instructions – you’re gaining priceless knowledge. 1/2 cup chopped herbs(mixture of parsley, tarragon and chives). I used 1tablespoon dried tarragon. 1. Mix the kosher salt and sugar together rub the salt-sugar mixture all over the salmon, on top and underneath. 3. Wrap salmon in plastic wrap and then in the aluminum foil, and place in the refrigerator minimum for 6 hours or overnight. 4. After the curing, unwrap the salmon. The salt and sugar should be absorbed by the salmon. If you see any salt left, just wipe it away with a paper towel. 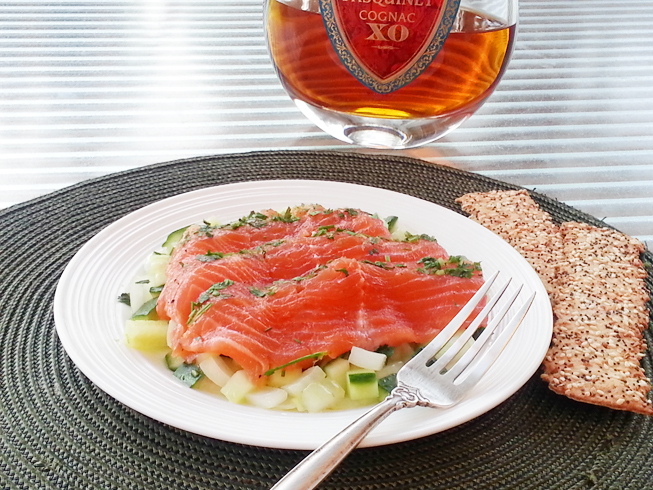 Rub the cognac over and around the salmon, and sprinkle with the rind of lime and the black pepper. 5. 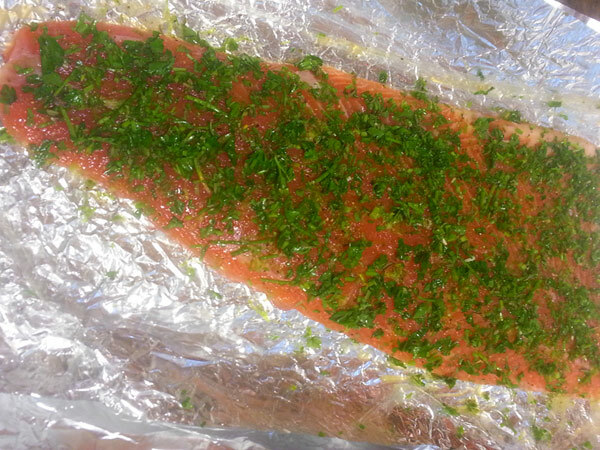 Cover with fresh herbs, patting them gently on top to cover the whole surface of the salmon. Re-wrap the salmon in the plastic wrap and foil, and refrigerate on a tray, with another tray. Weighted with the equivalent of at least 5 pounds, on top, to press the salmon and tighten the meat. Refrigerate, weighted, at least 2 hours. I left the salmon under the press for 12 hours. 1. Bring 2 cups of water to a boil, add the onion and stir well for a few seconds. Strain in a sieve and wash under cold water. Transfer the onions to a clean paper towel, and express most of the water. This process (blanching) prevents discoloration and makes the onion milder in flavor. 2. Mix the onion, cucumber, sugar, salt, rice vinegar, and oil in a bowl. Great recipe! Making it NOW!! !